If you're interested in viewing high quality goods from Sweden, visit Handla Svenskt online and have a look around (website in Swedish, English, German and Italian). 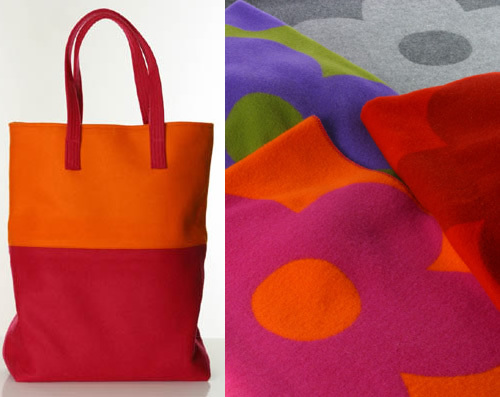 They carry the beautiful line of textiles from Ekelund (if you're local, you can see the complete collection at DS Designs in Marblehead), along with the Klippan collection of woollen bags and blankets in vivid colors and fun aprons with matching potholders. 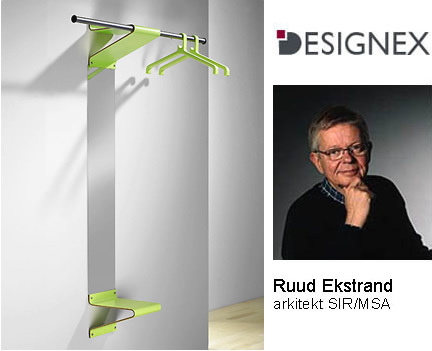 Handla Svenskt also offers the clean modern designs of Designex from Architect Ruud Ekstrand (love the clothes hanger with mirror and shelf, perfect for the entryway). Display Tip: In the photo below, doesn't the wall display of empty bottles appeal to you? So simple to arrange, yet so charming! There's so much to learn from product displays - take time to really look at images and copy some of what you see using items in your home that you already own. 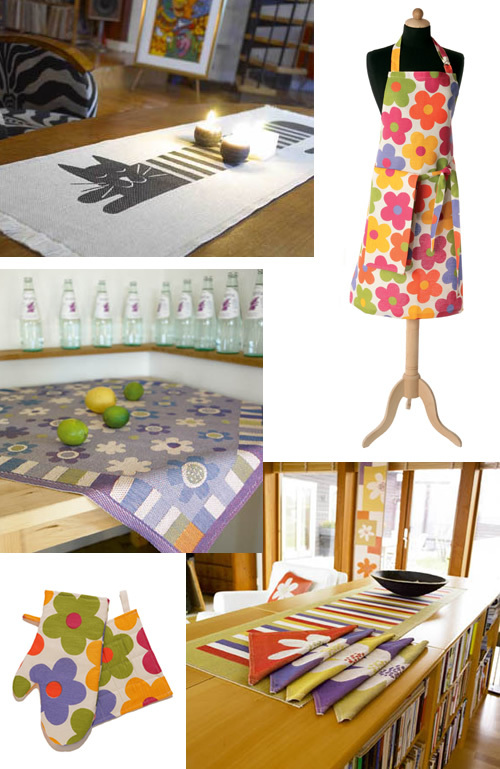 You'd be surprised at how you can transform your space by arranging items just a little differently... I like to use bottles that I find at Chinese and Japanese grocery stores, often they have the most gorgeous labels. When you're finished enjoying a yummy beverage, rinse the bottle well (careful to not wet and damage the label) and add a few of your favorites to a simple shelf. maybe white or your favorite wood, like birch or teak. You'd be surprised at what a statement a glass bottle with a beautiful label can make. Also, take the floral napkins below, folded into neat triangles, stacked and arranged nicely on the striped table runner. Can you see this on your dining room table? An alternate way to display your pretty napkins when guests aren't joining you for dinner.